During Monstober, Disney Channel is inviting fans of Descendants to enter the Show Us Your Descendants Style Contest for a chance to win! Five winners will each have their photo appear in a spot that will air on Disney Channel during the Mal-Oween programming block estimated to be October 23, 2015! Now through October 11, 2015, dress as your favorite Disney Descendants character and snap a photo using your digital camera or via the App on your mobile device. 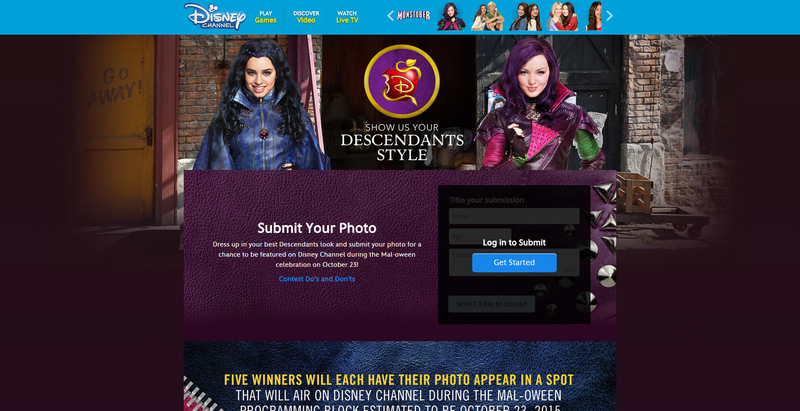 Once done, follow the instructions to submit your photo online at disneychannel.disney.com/show-us-your-descendants-style-contest or via the App to be entered into the Contest. Entries are limited to a maximum of one (1) Photo/Entry per day so keep uploading new photos every day for more chances to win! All Photos will be judged based on Creativity (40%), Relevance to Theme (40%), and Quality and Craftsmanship (20%) so be sure to be original, have fun and remember that costumes must be handmade! be willing to have your Photo published in the gallery page of the Disney Applause application and/or on the Website.